Home Education Monday history lesson. Assistant professor Chris Duvall discussed on Friday the origins of cannabis sativa, or marijuana, during the Student Organization for Latin American Studies’ final Brown Bag Lecture Series. He said the plant originated in Central Asia, spread across the continent to North Africa, and enslaved Africans brought knowledge of marijuana to Brazil. But it is unclear if they introduced the plant to South America. More recently, Duvall said, marijuana users have been stigmatized, but historically the plant has been used for medicinal, spiritual and holistic purposes. “It has been used as a narcotic, a food, and a source of fiber for about 6,000 years,” he said. 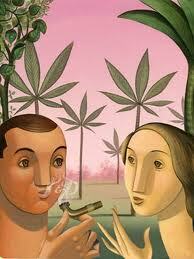 “The case of marijuana’s introduction to Brazil needs to have more attention given to it. Understanding the plant and its history is important, Duvall said, because cannabis is New Mexico’s third-largest cash crop. “Many people who are involved in cannabis either to grow it, to use it or to transport it are engaged in illegal activities, so they are not willing to share information about it,” he said. Previous articleToo much going on…..